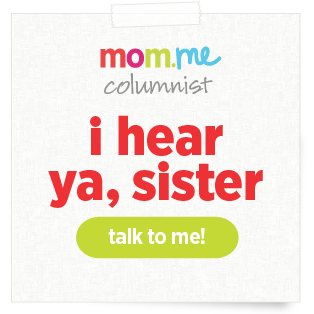 The following post (is adorable and) was written by my mom, WWW. Thanks, mom! I've been racking my brain to think up foods that will taste good to Rebecca in her present state of all-day-sickness with baby #3. Saturday I brought her a large container of home-made refried beans since they sounded good to her after I posted about them. To my delight, she ate two crispy tortillas smothered in beans and I thought things were looking up. The next day, I was ready to pile more on a tortilla but she gagged at the thought. So now I am back to the drawing board. 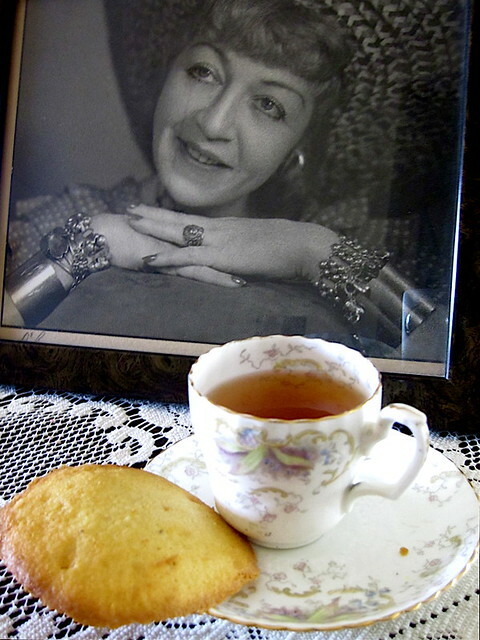 When I was a child, my grandmother, Mimi, made us the most amazing nutmeg tea cakes, or "Mimi cookies" as we called them, whenever we were sick or needed a special hug. We lived next door to my grandparents and so we had a steady supply of these cookies. They always made us feel better. 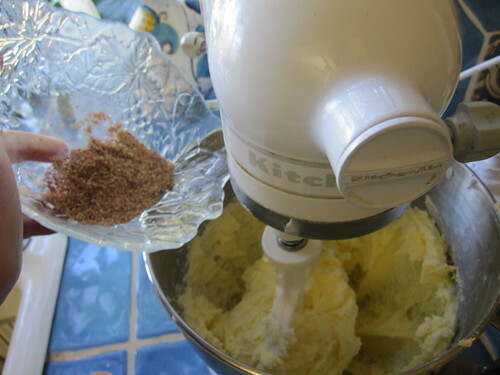 I used to help her grate the nutmegs -- 2 whole nutmegs goes into this recipe -- and I'd sometimes grate my knuckles along with the nutmeg, but I didn’t care. The smell of the fresh nutmeg filled me with joy as I anticipated the cookies, warm and moist from the oven. I, too, brought my kids up on Mimi cookies, a recipe that has been in our family for generations. Rachel once shared them at school and told the class that they were “a cookie that is a hug” and from then on, that is how I have described them to people—somehow eating these soft pillows makes you feel like you are getting the warmest hug possible. These are the cookies I sent in packages to my kids at college (usually by overnight mail so they would still be fresh). The only problem with Mimi cookies is that it’s hard to stop eating them when you don’t have a mom around telling you “you can have only two”. The last time I sent them to David several years ago, he called a couple of days later and told me not to send them anymore…that he got sick on them because once he started eating them, he couldn’t stop. “Can’t you just eat fewer or share them with your roommates?” I asked. “NO, Mom. It’s impossible. Just don’t send them!” This never made sense to me until last September when David and his girlfriend, Alyssa, took a train trip down the western US and ended up with us for several days. The whole family was gathering for a weekend of rare togetherness so I, naturally, made a double recipe of Mimi cookies. It was a beautiful weekend, the sun was shining and we were having a wonderful time playing in the pool. I placed a huge tray of Mimi cookies on the bar for all to enjoy and they were rapidly disappearing. Rebecca, reading magazines as she munched on cookies, soon fell asleep. At 4:00 we came inside—all except Rebecca who was still sound asleep on the chaise lounge. We figured she needed her rest so we left her alone, but about 6 pm, I thought I'd better wake her. She was disoriented and said she wasn’t feeling well, felt horrible in fact, and staggered up the stairs into bed, not waking up until 10 the following morning. When she finally got out of bed and stumbled down to breakfast, she still felt bad, had cotton mouth and felt woozie—like she had been drugged. “I feel stoned but not in a good way,” she said. None of us could figure out what happened, except that maybe she had some new type of flu. And that is when a light bulb when off in my head. I immediately searched the Internet to learn more about nutmeg and see if, indeed, it was the culprit. Sure enough, it didn’t take me long to find out that nutmeg, eaten in large quantities, causes all of the symptoms Rebecca experienced. 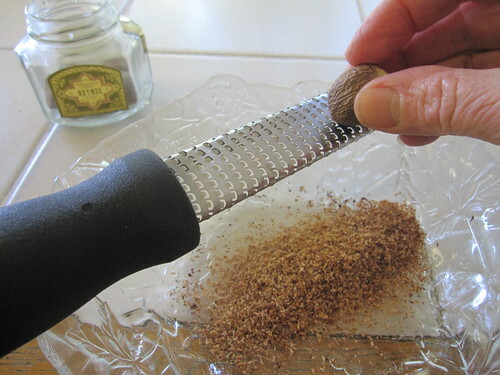 (If you ingest a whole grated nutmeg, this is enough to cause problems). 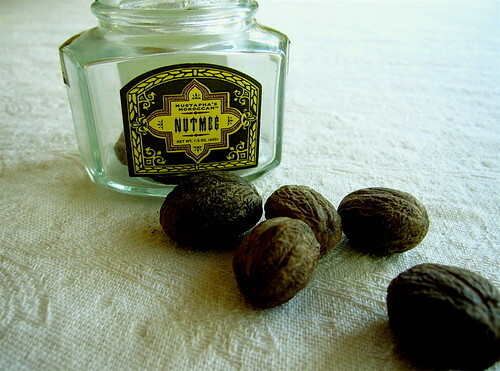 I found out that there are also lots of people out there getting a very uncomfortable cheap “high” from nutmeg. After watching Rebecca’s misery with it, I would say this is not advisable. I figured that Rebecca ate the equivalent to one nutmeg since she ate so many cookies and that is why she had a reaction. Nutmeg in small doses, which is how most of us eat it, doesn’t cause any harm at all. Oh no! I don’t think I can trust her with those! 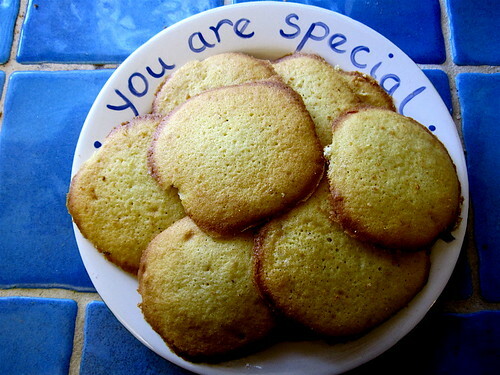 But I think I will make our “Cookies That Are a Hug” and put just a little nutmeg in them and add lemon peel. Maybe they will make her feel better—just like they have done, when eaten in moderation, for four generations in our family. And she can eat as many as she wants! 2. 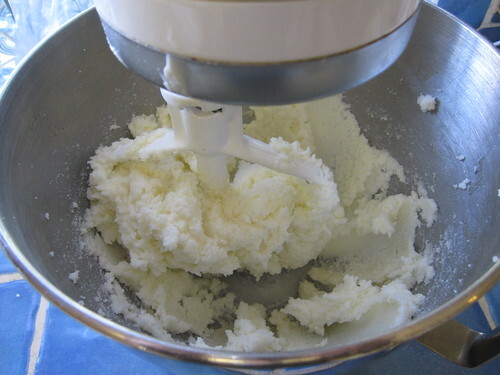 In electric mixer, cream together butter and sugar. 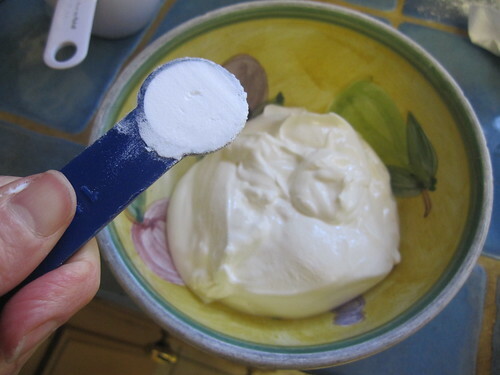 Stir baking soda into sour cream and immediately add it to mixture. Beat in a little at a time the flour. (The batter should be stiff). 3. Generously grease two large cookie sheets. 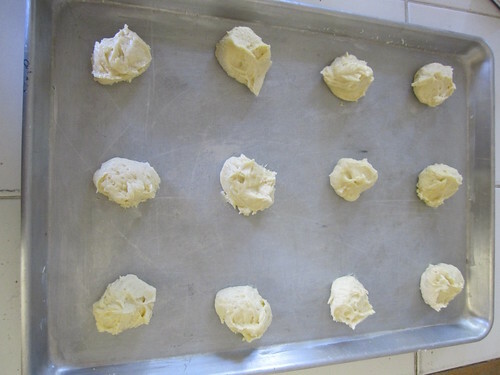 Drop about a tablespoon of batter for each cookie, spacing them several inches apart as these cookies expand. 4. Put cookies in oven. Bake for 8-10 minutes or until browned around the edges and slightly browned on top. 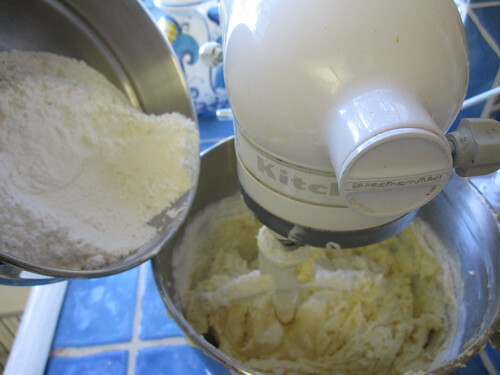 If they spread out too much while baking, add a little extra flour for the next batches. 5. 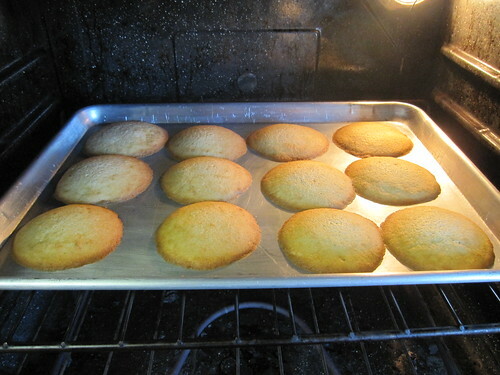 When the cookies are done, immediately put the hot cookies on a cooling rack using a metal spatula and start baking the second sheet of cookies. P.S. I just tried a lemon version of these for Rebecca. I cut the nutmeg down to ½ nutmeg, added two teaspoons of real lemon extract, and the grated peel of one lemon. (I added 4 more tablespoons of flour, too). 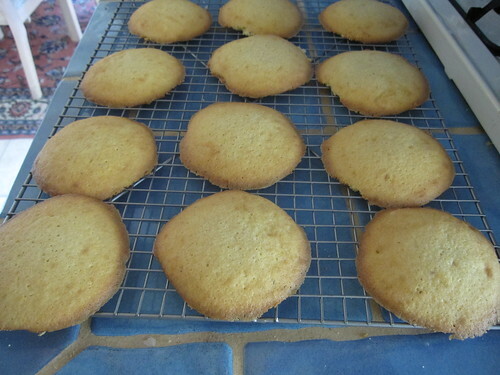 They turned out delicious (not quite as addictive as the nutmeg version but now we know why!). Those sound yummy. Feel better soon Rebecca. This is so cute. Your mom rocks my world. This post was like an essay that is a hug. What a sweet mom! I have never made cookies with nutmeg - I will have to try these. Also thanks for the little tidbit about nutmeg overdose - who would have thought it could make you feel bad. My husband tried the nutmeg thing when he was a dumb kid and can't eat nutmeg to this day. Definitely not something to fool around with! That said, I think this means if I make these cookies they'll be more for me! Ooooh these sort of look/remind me of madeleines. I couldn't find them last time I was at Trader Joe's (I hope they still have them around!) but perhaps these can replace them! I will definitely have to make these for my kids! Maybe I'll change them to "Gigi cookies" since they call my mom "Gigi"
These Mimi cookies are delicious, and perfect for sharing with your best friends! These look amazing! I think I'll make them this weekend. 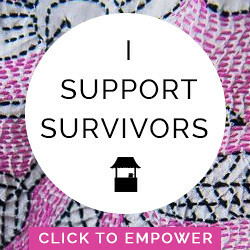 Has WWW considered her own blog? 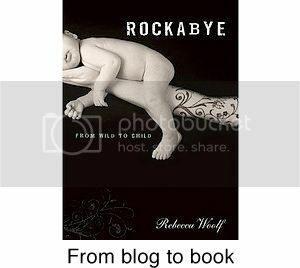 Not that I'm suggesting Wendy should abandon you, Rebecca. You need your mom. I mean, she could still guest post and stuff. I guess I'm just saying I really enjoy Wendy's recipes and her writing style and am always wishing for more! I'm definitely going to make these. Maybe when we move to our first apartment to make it feel like home. P.S. We called my dad's mom Mimi and my mom's mom Meme(with accents on the e's). Meme is a traditional french name for grandma I think (she's from Belgium). I never knew if anyone else used Mimi, I figured it was some Spanish thing (she was from spain). Anyway...very interesting. I adore the picture of Mimi!! Oh my. What style! Would you please give the amount of nutmeg in teaspoons? I'm assuming one can use it from the spice aisle - I can't always get whole nutmegs. And I hope you feel better soon Rebecca. Barbara, Fresh nutmeg is always more flavorful, but if you can't get the whole nutmeg, it's about 2 tablespoons of ground nutmeg. This post made my morning! I've been having a rough time due to some serious stress at work, & haven't wanted to 'dump' it on my husband (honestly, I'm worried he'll think I'm a bit crazy) Anywho, to get to the point, it reminded me that mom's are always there & I'd better call mine for some love & reassurance that I CAN be a good mommy myself & deal with work! Also, I will be making these cookies! 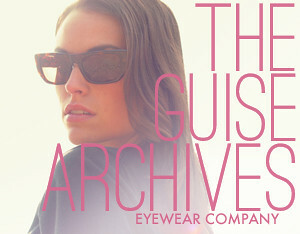 Heaven knows I don't need them physically, but emotionally they sound like just the trick! Meg, I'm sending you a virtual hug! It looks yummy,I will bake this for my kids.They will surely love it.. These cookies sound great (as well as the lemon version). Sounds delicious. Thank you for sharing the recipes. I just made these this morning. At first I followed the recipe exactly and watched in disappointment as they spread into a giant pool and burned on the bottom. Then I did as suggested and added more flour, and also reduced the time to 7 minutes. With these changes, they turned out beautifully. I can't wait to use this recipe with fresh lavender in the summer!